Team Intrack wrapped up a project installing 100mm untapered internal halyard flagpoles at the Burwood Heights Shopping Centre. They look so good, you almost don’t even see the abandoned shopping trolley nestled between them (pictured right). Our 100mm untapered internal halyard flagpoles are very cost effective and can be fabricated to 7.0 or 8.0 metres tall. 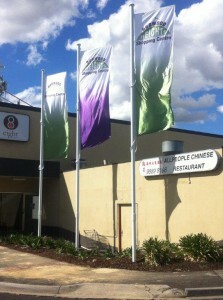 For more information about raising the profile of your business with a corporate flagpole, contact Intrack.